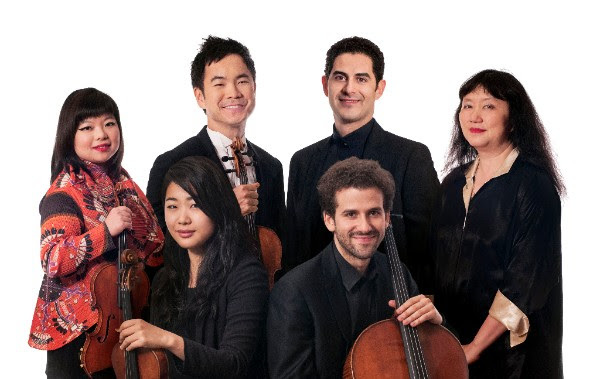 The Vancouver Playhouse, 600 Hamilton St.
Kristin Lee received a 2015 Avery Fisher Career Grant, and was a top prizewinner at the 2012 Naumburg Competition and the Astral Artists’ 2010 National Auditions. She is a soloist, recitalist, chamber musician, and educator. She has appeared with top orchestras in the USA, Russia and South Korea, and in recitals in the USA, Europe, and South Korea, and as a chamber musician at festivals in North and South America. She is the concertmaster of the Metropolis Ensemble, with which she premiered Vivian Fung’s Violin Concerto, written for her, which appears on Fung’s CD which won a 2013 Juno Award. Born in Seoul, Ms. Lee moved to the USA to study, receiving a master’s degree from Juilliard, under Itzhak Perlman. A former member of CMS Two, she is a member of the faculty of the Aaron Copland School of Music at Queens College and is the co-founder and artistic director of Emerald City Music in Seattle. Violinist/violist Yura Lee, recipient of a 2007 Avery Fisher Career Grant, has performed as soloist with numerous major orchestras and has given recitals in many of Europe’s major cities. At age 12, she became the youngest artist ever to receive the Debut Artist of the Year prize at the Performance Today awards given by National Public Radio. She has received many international prizes, including the first prize and audience prize at the 2006 Leopold Mozart Competition, first prize at both the 2010 UNISA International Competition and 2013 ARD Competition, and top prizes in the Indianapolis, Hannover, Kreisler, and Paganini competitions. Her CD with Reinhard Goebel and the Bayerische Kammerphilharmonie, Mozart in Paris, received the Diapason d’Or Award. As a chamber musician, she regularly takes part in music festivals in the USA and Europe. Ms. Lee was a member of CMS Two, as both violinist and violist, and has recently joined the Anso Quartet as first violinist. Winner of a 2009 Avery Fisher Career Grant, Arnaud Sussmann was born in Strasbourg, France and now is based in New York City. He trained at the Conservatoire de Paris and the Juilliard School with Boris Garlitsky and Itzhak Perlman. Winner of several international competitions, he was named a Starling Fellow in 2006, an honor allowing him to be Mr. Perlman’s teaching assistant for two years. He has appeared as soloist with many of the world’s top orchestras and is a regular attendee at music festivals in the USA. Mr. Sussmann has performed with many of today’s leading artists. A member of the CMS since 2006, he appears with them regularly in New York and on tour. He has made recordings and been featured on PBS’ Live from Lincoln Center broadcasts alongside Itzhak Perlman and the Perlman Music Program, and with the CMS. Violist Richard O’Neill is an Emmy Award winner, two-time Grammy nominee, and Avery Fisher Career Grant recipient. He has appeared as soloist with many top orchestras. His season includes a European tour with the Ehnes Quartet, and his tenth season as artistic director of the chamber music initiative DITTO, which has introduced tens of thousands to chamber music in South Korea and Japan. As recitalist he has performed at major concert halls throughout the world, and is a former member of CMS Two. A Universal/DG recording artist, he has made eight solo albums. Dedicated to the music of our time, he has premiered works by Elliott Carter, John Harbison, Huang Ruo, and Paul Chihara. He serves as Goodwill Ambassador for the Korean Red Cross, The Special Olympics, OXFAM, and UNICEF and runs marathons for charity. Cellist Nicholas Canellakis has performed throughout the United States and Europe to critical acclaim. He is a frequent guest at Bargemusic in NYC, and has performed at many other important music festivals. From 2008 to 2010, he was in residence at Carnegie Hall as a member of the Academy, in which he performed regularly at Carnegie’s Weill and Zankel halls and worked closely with New York City public schools to enhance their music education. His honours include first prize in the Musicatri International Competition in Italy and a top prize in the Johansen International Competition in Washington DC. He is principal cellist of the New York String Orchestra. He graduated from The Curtis Institute of Music and holds a master’s degree from the New England Conservatory. Mr. Canellakis has produced and directed several music videos and fictional shorts, and hosts a comedy web series, “Conversations with Nick Canellakis.” He is an Artist of the CMS and a former member of CMS Two. The Friends of Chamber Music thank the Vancouver Recital Society for the generous loan of their Steinway piano for this concert. Leclair was born in Lyon, but left to study dance and the violin in Turin. Leclair moved to Paris in 1723, where he played at the Concert Spirituel, the main semi-public music series. His first wife died in 1728. His musical works included several sonatas for flute and basso continuo. In 1730, Leclair married again. His new wife was the engraver Louise Roussel, who prepared all his works for printing from Opus 2 onward. Named ordinaire de la musique by Louis XV in 1733, Leclair resigned in 1737 after a clash with Guidon over control of the musique du Roy. Leclair was then engaged by the Princess of Orange – a fine harpsichordist and former student of Handel – and from 1738 until 1743, served three months annually at her court in Leeuwarden, working in The Hague as a private maestro di cappella for the remainder of the year. He returned to Paris in 1743. His only opera, Scylla et Glaucus, was first performed in 1746 and has been revived in modern times. From 1740 until his death in Paris, he served the Duke of Gramont. Leclair was renowned as a violinist and as a composer, drawing successfully upon many of Europe’s national styles. Many of his suites, sonatas, and concertos survive, along with his opera; some of his vocal works, ballets, and other stage music is lost. In 1758, after the break-up of his second marriage, Leclair purchased a small house in a dangerous Parisian neighborhood, where he was found stabbed to death on October 23, 1764. In the realm of chamber music Françaix wrote works for winds, works for strings, and works in which strings and winds join forces. The especially successful String Trio, was composed in 1933, and dedicated to the Pasquier Trio, a distinguished family ensemble well known in French musical life. This concise and vivacious work is a celebration of the neoclassical movement that was in vogue at the time. The opening movement, Allegretto vivo, is a lively yet intimate conversation among the three instruments, all played with mutes. The viola has a motif spelling the name Bach in reverse, the notes B, C, A, B-flat corresponding to HCAB in German notation. The Scherzo that follows is vivacious and is played without the mutes. These are replaced for the songlike slow movement, Andante, set in A minor and written in rondo form. Here the violin serves as a gently accompanied soloist. The mutes are removed again for the Finale, set in the home key of C major. This movement outdoes the Scherzo in sheer, effervescent drive (it has been described as a chamber-music cancan). The work ends surprisingly softly, though, fading away in a gentle yet pointed pizzicato gesture. Around the time he heard the jazz band that inspired his Violin Sonata, Ravel struck up a friendship with British-Hungarian violinist Jelly d’Arányi. It was her captivating renditions of gypsy music that prompted him to write this colorful and bracingly virtuosic rhapsody in the gypsy style (the title Tzigane means “gypsy” in French). “This Tzigane must be a piece of great virtuosity,” Ravel told the violinist. “Certain passages can produce brilliant effects, provided that it is possible to perform them—which I’m not always sure of.” Although Ravel frequently consulted with d’Arányi while the piece was in progress, she reportedly received the finished score only a couple of days before giving the premiere in London on April 26, 1924. On that occasion, the music’s gypsy flavor was enhanced by the use of a modified piano called a luthéal, outfitted with a device that made it sound something like a Hungarian cimbalom or dulcimer. Ernest Chausson was born into a rich family. He graduated in law in 1877, but vacillated over the choice of a career. In 1879 he went to Munich to hear Wagner conduct The Flying Dutchman and The Ring. He was so impressed that he enrolled in the Conservatoire, studying composition with Jules Massenet and César Franck. He imbibed Franck’s technical approach to composition—the initial “generative cell” and cyclical thematic recurrence, and also his spiritual approach to composition as a high moral calling. The Concert, Opus 21 is regarded as Chausson’s first “mature” chamber work and was influenced by Franck’s piano quintet. The principal themes were sketched in May 1889 but he only finished the work in 1892. Its première in Brussels, on 26 February 1892, featuring the Ysaye Quartet, was one of the most decisive triumphs of Chausson’s career. The work has an unusual structure, being scored as a violin sonata, a piano solo, a string quartet or quintet, a piano quintet, or (when tutti) a piano sextet. Written in four movements, the basic structure of the outer movements is in sonata form. In the first movement the generative cell is a three-note motto played in parallel octaves, fortissimo. After an extended rumination on the motto by the quartet and piano, the solo violin bursts out with the first theme proper. The second theme brings the climax of the movement. After that, the first theme and the motto return as a quiet benediction. The haunting Sicilienne, set in A minor, evokes a common type of Baroque movement through obsessive rhythms and faintly antique harmony. The structure of the movement is rondo-like, but without sharply contrasting episodes. It ends serenely in A major, serving as a foil for the following slow movement, Grave in F minor, the traditional key of lamentation. The finale sets off in D minor with an agitated theme that bucks the metrical patterns of 6/8 time. In the development, themes from earlier movements begin to appear, most prominently the choleric second theme of the Grave, first as a cantus firmus in even note values, then in its “unvarnished” form. Chausson’s manipulations of rhythm grow increasingly complex. At one point in the recapitulation, the principal theme is sounded in its initial form and later as a slower-moving cantus firmus. In the coda, très vif, it transforms into a dizzying waltz. Faithful to the Franckish compulsion to stage a réunion des thèmes before the end, Chausson sweeps into a climactic recall of the Grave theme, then the first theme of the opening movement, and finally the three-note motto. To purchase tickets for any of our upcoming concerts, click here!